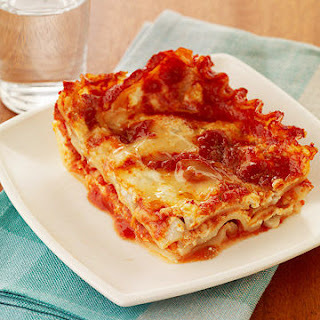 Recipe Source Online: Crockpot Lasagna - Now THAT's Comfort Food! Crockpot Lasagna - Now THAT's Comfort Food! 1.Coat a 4-quart slow cooker with cooking spray. In a large microwave-safe bowl stir together pasta sauce and water. Cover bowl with waxed paper and microwave on high for 3 minutes. Meanwhile, in a medium bowl stir together ricotta cheese and carrot; set aside. 2.Spoon 1/2 cup of the sauce mixture in the bottom of prepared slow cooker. Break half of the noodles to fit the bottom of the slow cooker and arrange over the sauce in the slow cooker. Spoon mounds of half of the ricotta mixture over the noodles. Top with 1/2 cup of the mozzarella. Spoon half of the remaining sauce over the layers. Top with remaining noodles, breaking to fit, remaining ricotta mixture, and 1/2 cup mozzarella. Spoon remaining sauce over and top with remaining mozzarella. 3.Cover; cook on low heat setting for 3 hours (noodles should be tender). Remove crockpot from liner and let stand covered for 20 minutes. Makes 6 servings.